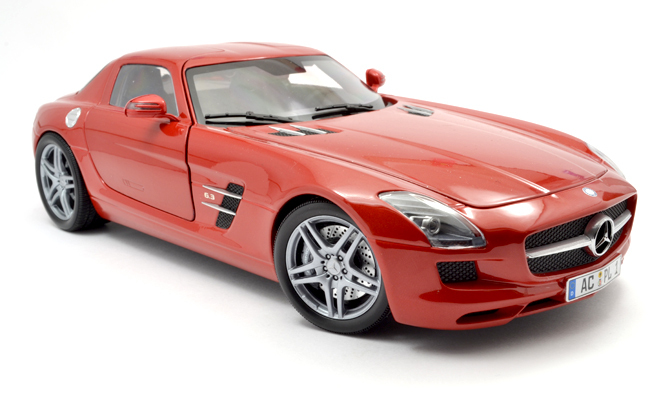 The Mercedes-Benz SLS AMG is the newest super sports car from Mercedes-Benz’s subsidiary AMG Company specializing in high-performance luxury cars. 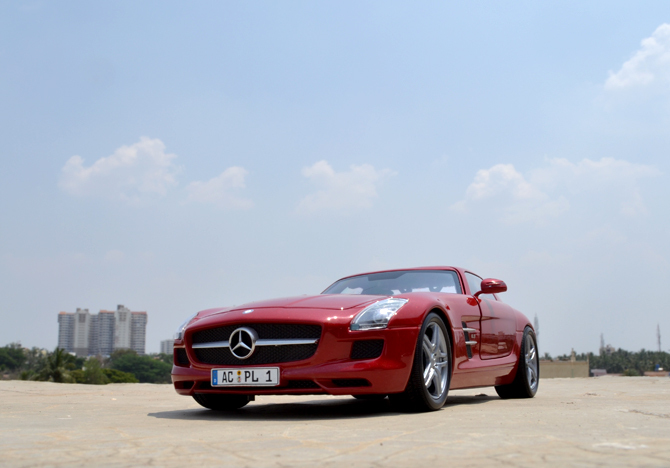 It delivers a compelling mix of purist styling, consistent lightweight design and superior driving dynamics. 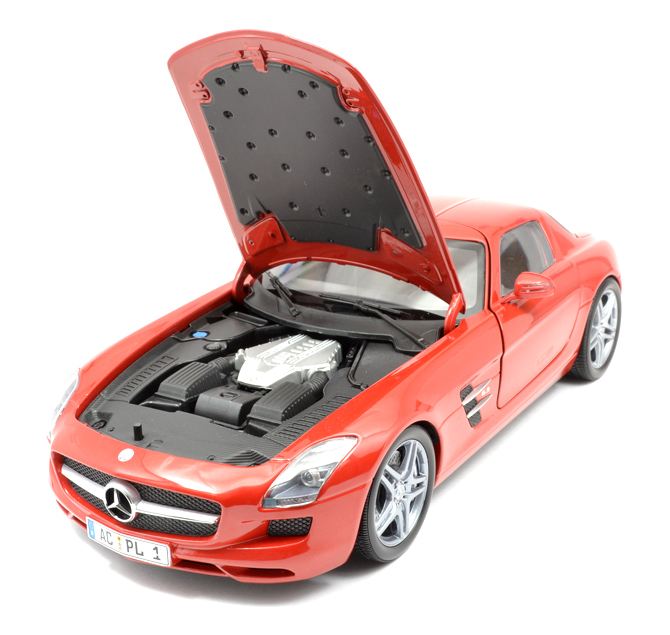 At the same time, the Mercedes-Benz SLS AMG fully lives up to all the expectations of hallmark Mercedes everyday practicality and optimum safety. 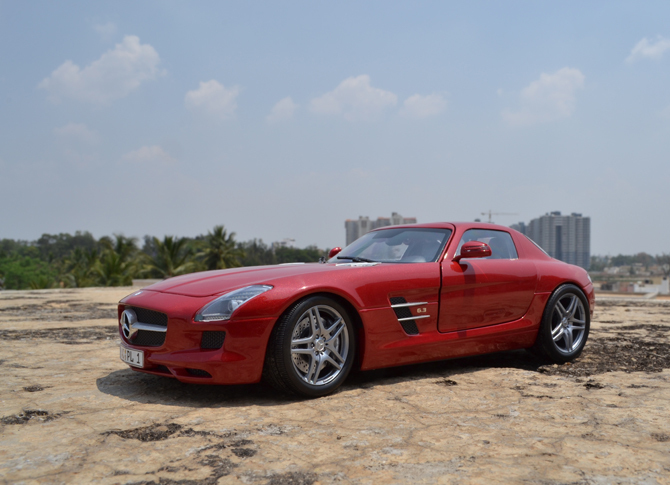 Its technology package includes aluminum space frame body with gullwing doors, AMG 6.3-litre V8 front-mid engine developing 420 kW / 571 hp peak output, 650 Nm of torque, seven-speed dual-clutch, sports suspension with aluminum double wishbones. 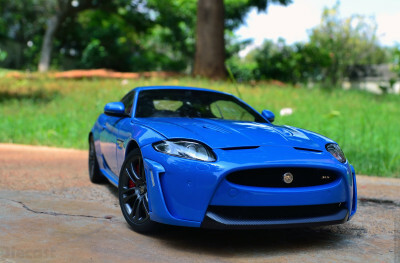 Weighing at just 1620kg its V8 can propel it from 0 to 100 kmph in 3.8 seconds, before going on to a top speed of 317 kmph (electronically limited). 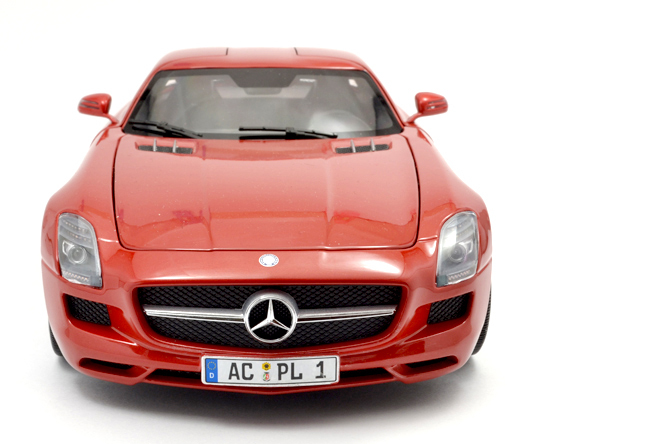 Ok let’s come to the point, I did not get a real car though a 1:18 diecast scale model made to near perfection by Aachen (Germany) based Minichamps. This is my second Minichamps and the Best so far! 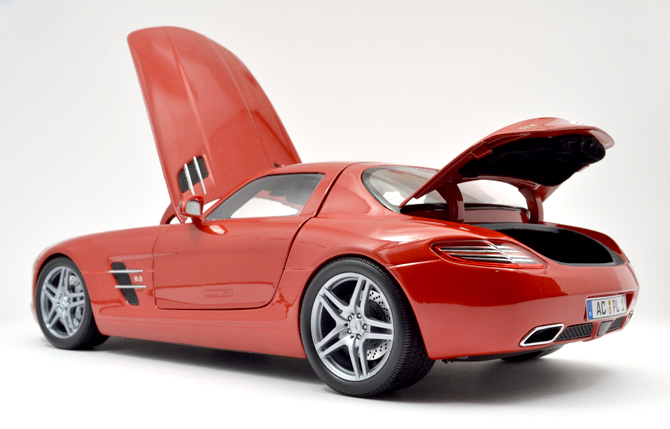 I had been following development of this model since TVC of Michael Schumacher and this very color SLS on that crazy stunt. 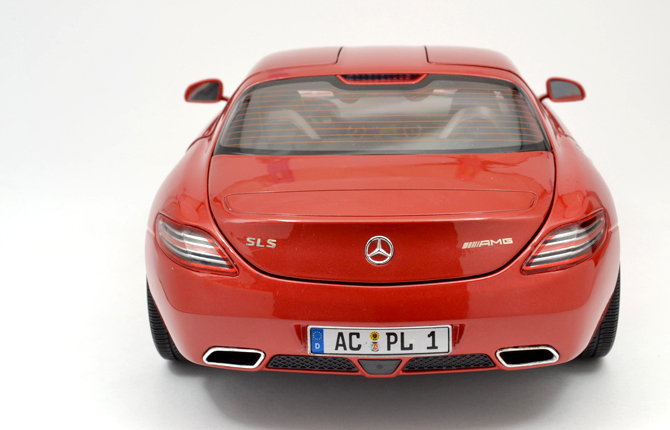 Unfortunately this red version is a late comer and also the hottest of the lot. It was released by December 2010 but my preordering date goes back to July 2010 when it was opened preorders… The other colors like Black, Silver, White and Gray are all equally competitive color but this is the best! Let start! 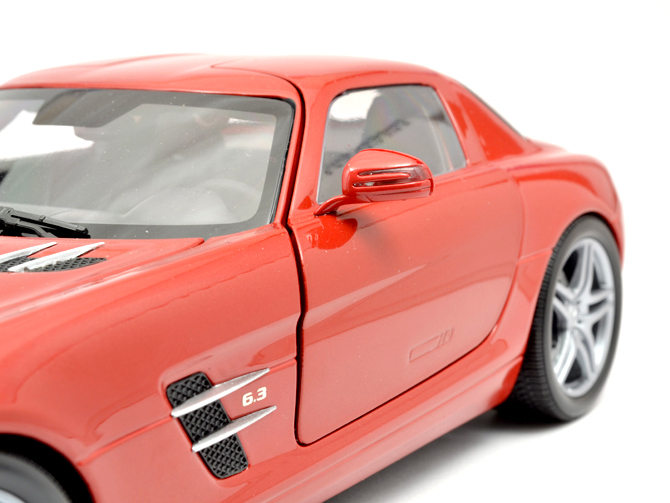 The first and far most striking thing about this diecast model is its color. Unlike other red car models (Ford GT, Carrera GT and so on) in my collection this paint finish is quite different, quite luxurious just like the real car. 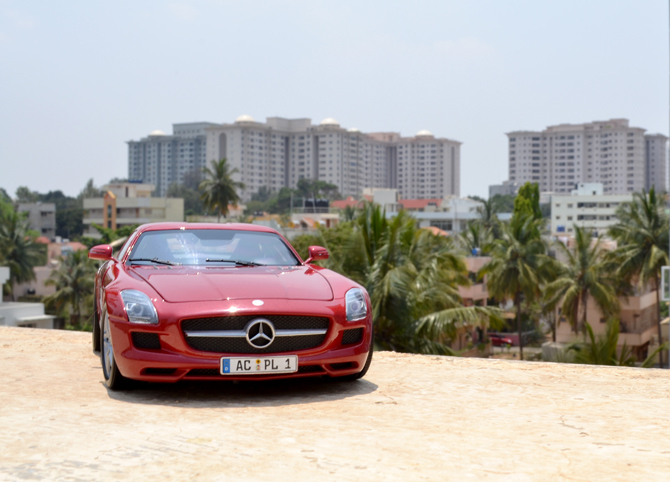 It is not a sport Ferrari red but an even better shade of its own. The body work is fantastic! Its finished with all smooth line and prefect curves in place. 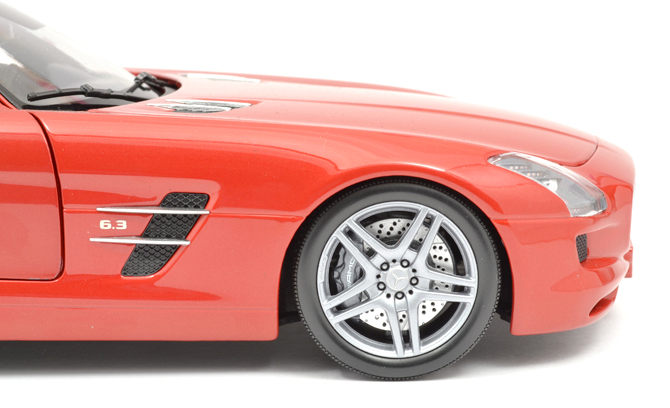 All modern car (especially the sports car) are developed in a wind tunnel but I want to ask Minichamps weather they the same approach for this model as well? It is that perfect. 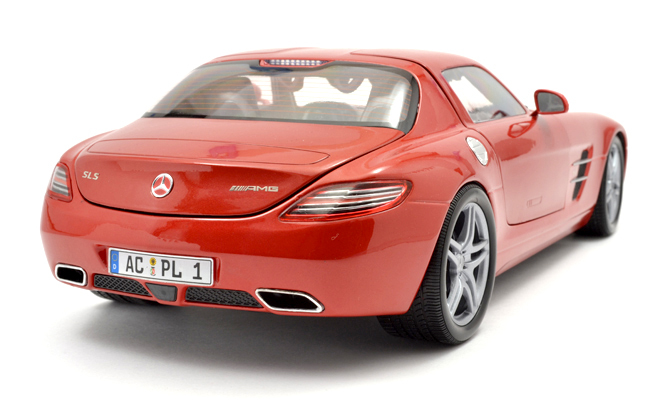 I have seen model made by budget brands like Maisto trying to wow the buyers with that popup rear spoiler but mine doesn’t have any gimmicks like that. Its all true detailing not more than that. The Head lamp leasing is on par though I expected a better detailing but the tail lamp setup rectifies that hole with some exceptional lines and translucent finish to give that LED effect. The tempo badging is nice but slightly oversized as per my observation. Long contemporary hood and longish design is superbly replicated with the low slung design carried over all around. The rear wheels stay a little higher which gives real car like feel with the heavy V8 engine pushing the front wheels downward. The fuel cap finished in alloy shade is also a nice touch but not realistic! 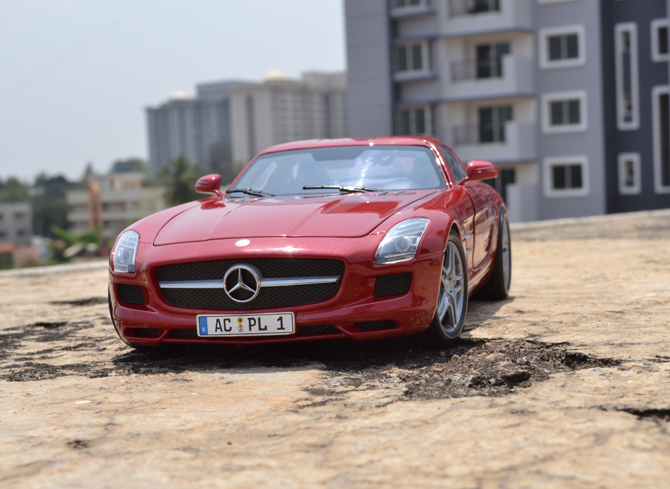 The original SLS alloys are designed to show off the AMG badge and the huge disc. Minichamps in this model has done a real good job in replicating this with a strong bold AMD text engraved in the calipers and the neat alloy works its magic. To top it off even the alloys are engraved with the same badge which is clear even at just 1mm. 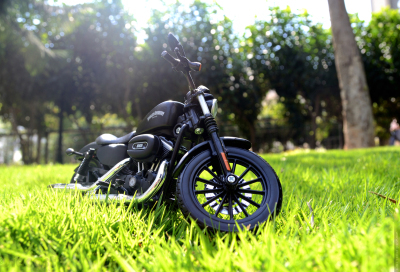 Tough a premium branded model it does comes with a fair amount of flaws. 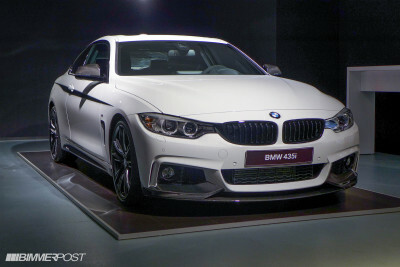 First I expected a real mesh grill like that of the AUTOart signature range but in vain no! 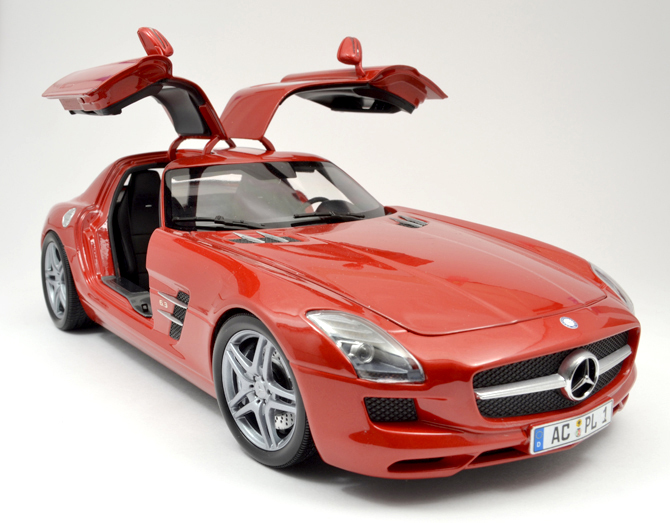 The worst of all is the excess gap between the gullwing door and the body, which I would call badest even on a Maisto. Minichamps go to do a better QC. 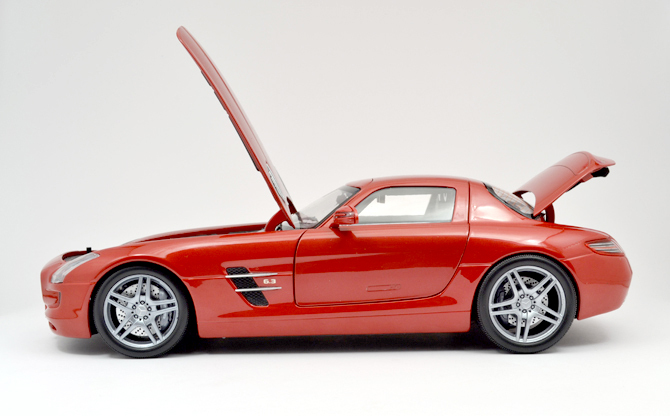 Let go back to the good point again, the gullwing oozes with flare and style is replicated to a very last details. First I thought the door hinges is kind of nasty! But later started liking it because it just works perfectly without compromising on aesthetics. See for yourself and comment if I am wrong. 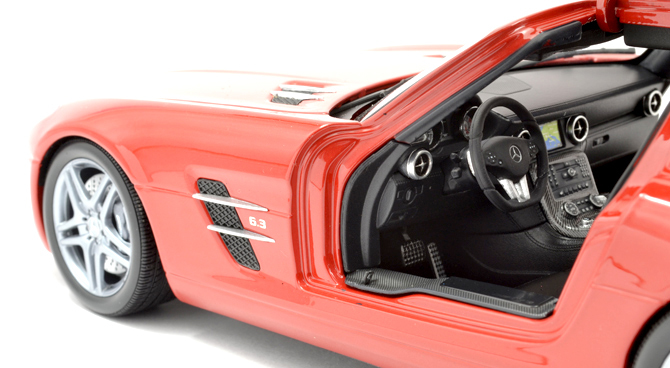 The interiors are exceptional starting from the door hinges, which decently hides away. The multi functional steering is a pinnacle so as the dials. The satnav take a effective spot, thanks to the bright color and the bezel around. 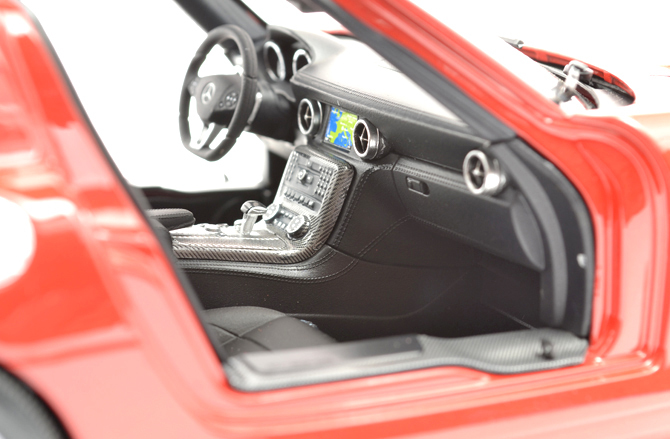 Carbon fiber finish done on the center console is brilliant. The seats are made of plastic (as expected) but the stitch effect takes this to the next level of detailing. Engine bay and detailing is where most diecast makers lose spot but here they get a point or two extra for such a nice job. 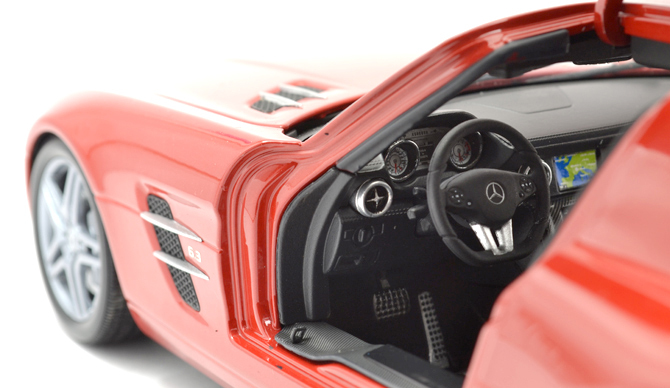 The hood being flush becomes a pain to open in most cases but Minichamps made a nice move by providing a simple yet effective hood underneath. 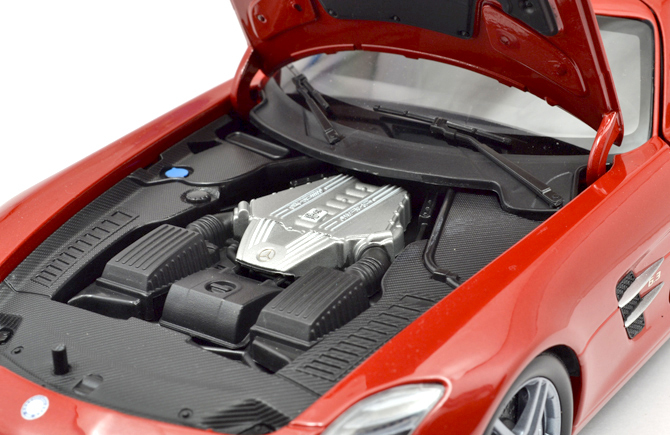 The engine bay is looks more placticky but the finish on the cover, engraving and molding are all done perfectly to camouflage it. The underlining black heat sink is textured adding more detailing to the ever growing list of mentions. The hood hinges are stubby but very effective in doing its job. Personally I have never seen any car (atleast on diecast) which has a huge angle of open which is good for displaying with it opened. The boot open is sufficiently ok to see what it can hold. Finally I have come to a conclusion to rate this model at 4.5 stars! WHY? This would have got 5 if the grills are real mesh and the door gaps (I guess only on mine I guess). 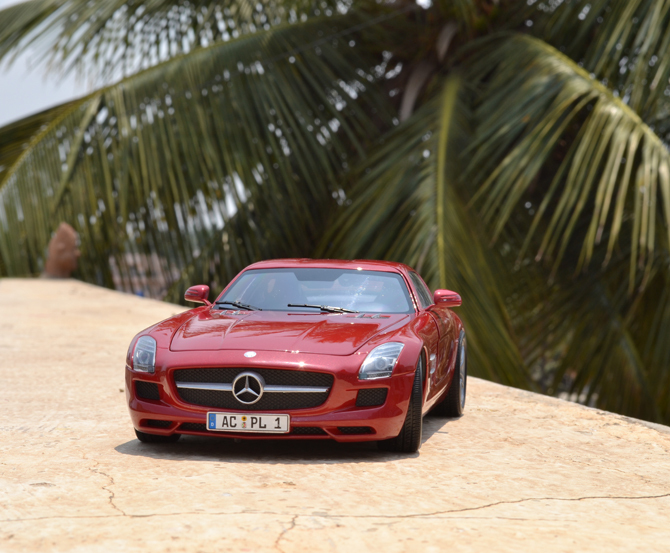 With our review done lets enjoy some outdoor photos, hope you like it. Bye now see you again with more reviews and pics! It is imported from UK at £69.99 + £20 (shipping). The Maisto version is good too but the details are not comparable to the Minichamps version I have in here. But Maisto comes with a pop rear spoiler which I did not get in mine. At 1/4th the cost Maisto is great value for money!!! 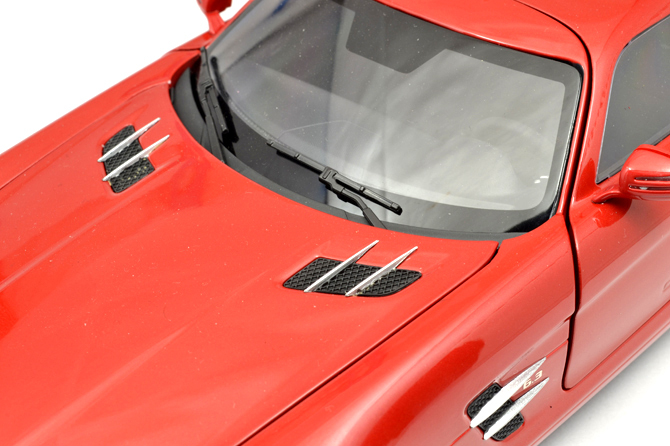 But As far As I know.. Minichamps should have that feature… a popping wing… Because it has much more details than Maisto… and have you tried to pop it out? I am positive about the pop spoiler! The reason why I think the minichamps dint have a pop spoiler is that they wanted a operable boot. Great its worth every single bit to wait!!! You know I waited for over 6 months. I am drooling, fantastic. I Know you are an 1:18 aficionado, but take look at Welly’s 1:24 Panemara and Jaguar XJ limousine for their exceptional craftsmanship. 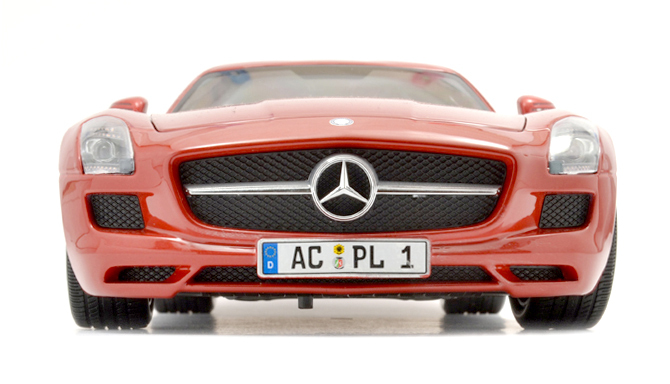 Thanks Eugin, I will take a look at them this weekend in some toy store and buy it if they are cool… I do have five 1:24 in collection but very much driven to 1:18 as they work very well as my photography models with turning wheels and doors etc…. I own the Maisto version of this and despite being a Premier Edition, the detailings are no match for this. Mine got no crossed drilled holes in the brakes, the lights hav less details, the rear lights have visible holes and the list goes on… The most impressive of your model is definitely the interior! From the photos you took it looks real! Mine is a Minichamps at four times the cost of your Maisto! So details should be there but I still feel sometimes its not worth the price…. For its door hinges and grill detailings etc. NICE ~ Model n Color ! Asaran you are the man …. I loved each and every single collection of yours … I wanted to collect something like you its my dream. Your photography is amazing. I want to buy a “Lamborghini AVENTADOR LP 700-4 ORANGE 1/18” please suggest me from which manufacturers should I buy ? I saw it in bburago .. Can’t wait to get it ..
WFT Lamborghini AVENTADOR read this http://www.xdiecast.com/?p=1644.. It is made by Bburago for budget collector and MR collection also makes it to satisfy the premium end. I hope another Diecaster would think of . An operate-able boot with a popping wing . a boot feature with a very small hinges for the wing to pop. just like the autoart’s hinges. from Dog Legs to very Realistic Hinges , Just Like Lambo Miura . Operatable Engine cover with an Operatable boot . 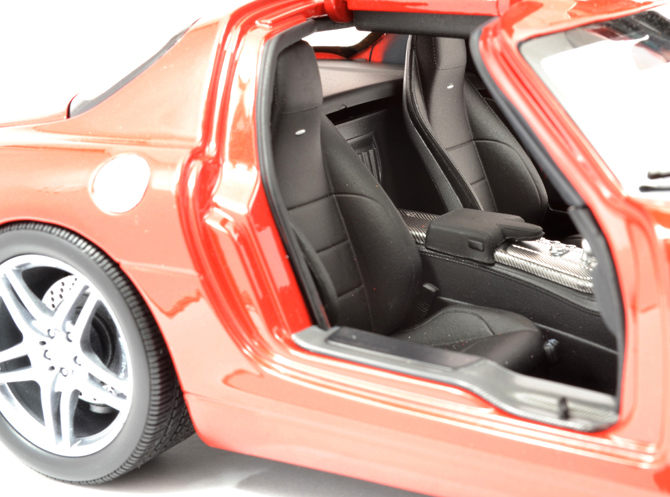 The boot is connected to the engine cover and also have the sufficient space for luggage. Wow! What a great website and brilliant photography. You remind me of me 10 years ago when I was buying every month! Unfortunately, now I don’t have space for my lovely collection. 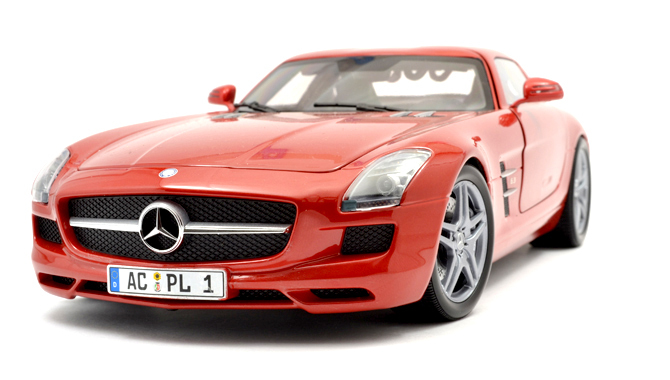 Let me know if you are interested in buying – I have about 15 in my collection, all 1:18 scale, including some absolutely rare models by Kyosho and Autoart such as the Mercedes 190E 2.5 16v EVO II, E30 BMW M3 Evo Sport, Ferrari 328 GTS, Lamborghini Countach 1987, Porsche 911 GT2 (996) etc all immaculately kept. I would be happy for them to go to a good collector like you.